Oak and Teak glue, the all wood glue, is a two part epoxy resin made largely from the resins of wood itself. That is why it can dissolve the natural oils of oily hardwoods, and why it bonds all oily hardwoods such as Teak, Cocobolo and Ebony. Oak and Teak Epoxy Wood Glue will of course bond all non oily hardwoods. Oak and Teak Epoxy Wood Glue is unaffected by the natural acids common to many woods, which is why it bonds Oak so readily. It will fill gaps and delivers astonishing bond strength and durability and is completely waterproof and weatherproof once set. It will also (with proper chemical surface preparation) glue a wide variety of metals(instructions here), glass, rubber and plastic materials(instructions here). 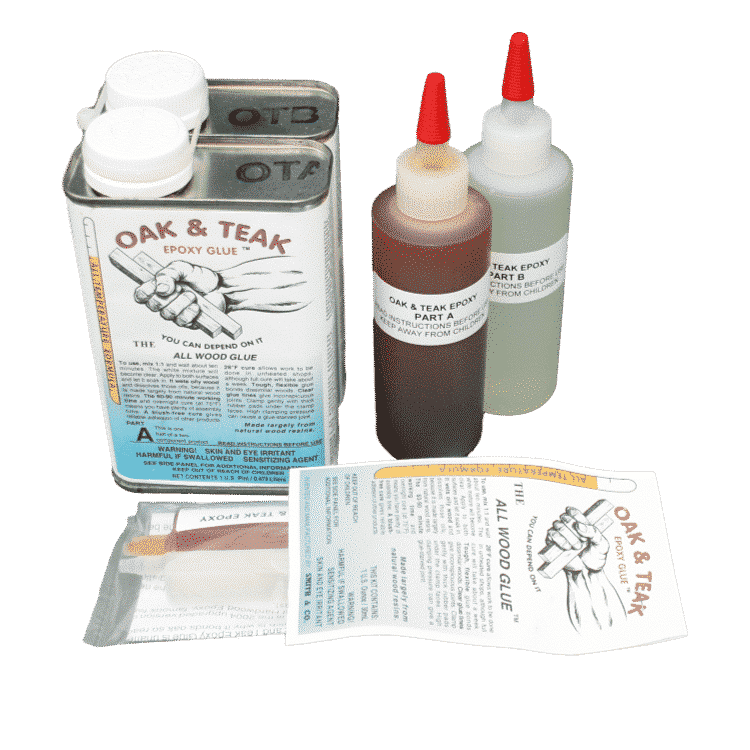 Oak and Teak glue, the all wood glue, is a two part epoxy resin made largely from the resins of wood itself. That is why it can dissolve the natural oils of oily hardwoods, and why it bonds all oily hardwoods such as Teak, Cocobolo and Ebony. Epoxy glues made from petrochemicals cannot do this. Oak and Teak Epoxy Wood Glue will of course bond all non oily hardwoods and softwoods that lesser epoxies are also capable of gluing. Oak and Teak Epoxy Wood Glue is unaffected by the natural acids common to many woods, which is why it bonds Oak so readily. It will also (with proper chemical surface preparation) glue a wide variety of metals(instructions here), glass, rubber and also glue plastic materials(instructions here). The cured adhesive is completely waterproof and weatherproof. 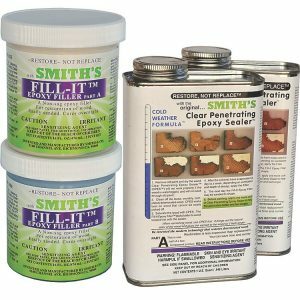 Our Epoxy Cleanup Solvent will dissolve and clean up excess Oak and Teak Epoxy Glue before it has gelled. Once cured, there is no clean-up solvent. The cured adhesive is easily sanded back, and leaves an unobtrusive glue line. It is a translucent orange in colour. 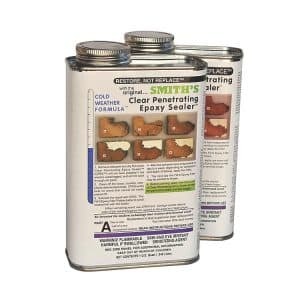 Oak and Teak epoxy glue uses Smith and Co’s Dual Synergistic Catalyst™, a breakthrough in the control of epoxy resin curing. This new technology not only gives a long working time (without smoking like other brands), but also cures twice as fast as older-technology products. 1 to 1 mix ratio by volume and is forgiving of minor mix disparities. If mixing by weight use 10 parts A to 12 parts B by weight. Oak and teak epoxy dries to a translucent pale orange. It is easy to sand and leaves very inconspicuous glue lines once finished. Oak and Teak Epoxy resin will fill gaps in joints. I have spent the last 40+ years working with a large variety of adhesives on a large variety of materials. This is truly the most remarkably versatile adhesive that I think I have ever used. ‘Hyper Glue’ or some other such adjective would be a better name for it. Do try this adhesive if you ever make or repair stuff, you will find it an invaluable asset in your toolbox. It is not a fast set, and you do have to mix it, but the bonds are both waterproof and permanent to so many materials. Please read the comprehensive instructions that are between the two cans or within the outer packaging before use. If you are buying a pack of 950ml or above, supplied in tins, please give serious consideration to also purchasing a squeezy bottle pack. It is easy to refill squeezy bottles from the tins, and is far easier to dispense small quantities from them. When dispensing larger quantities mixing by weight is easiest and only requires a modern cheap set of digital kitchen scales. Mix by proportion 10 parts A : 12 parts B. Gluing wood with Epoxy Resins? Oily hardwoods – How to glue them? Use of Oak and Teak Glue? What woods can I glue with Oak and teak Epoxy Resin? All epoxy resins can cause skin sensitisation. Wear suitable protective equipment. The safety data sheets are available under the MSDS tab on this page. Used to Glue Iroko chairs together and add sapele Splines , very good product, clear instructions, excellent service from Steve. would and will be buying again. My first DIY repair. After my lovely dining chair broke I decided to do my own repair rather than trust the job to another after some less than prefect previous experiences. The Oak and Teak epoxy was very easy to use and worked perfectly. My only regret was that I had no other jobs to do as I used so little of the product and have almost full tubes left. Great specialist product and quickly delivered. Oak and Teak Epoxy. This product is fantastic. To try the product out I made a simple biscuit joint – much quicker than mortice and tenon – followed the instructions carefully and left the joint to set for 24 hours. I found it impossible to snap the joint by hand -it is absolutely solid. I have just ordered a larger quantity of the epoxy and am looking forward to assembling 17 oak cabinet doors. Fantastic product – follow the instructions and you will not be disappointed! Oak and Teak Epoxy. On a bus restoration project, I needed to plug up some oversized bolt holes, in the ash framework, and re-drill them. With another adhesive, I found that the remaining thin shell of the ash plug sometimes broke away on re-drilling. I was advised to use epoxy adhesive, and found this to be the solution. epoxy glue. First class service coupled with excellent product. Coffee Table with Oak and Teak Epoxy. Back in August this year, I needed to glue together pieces of new teak – mortise and tenon joints – in order to make a small coffee table to match existing teak tables I already have from years ago – they are no longer commercially available. I had great difficulty finding an appropriate glue until I stumbled across your products on the web.I needed a glue that would allow me time to adjust the pieces for correct fit and to clamp them, when adjusted, to a timber jig made to hold all in the correct position and alignment while setting.It transpired I needed some 30 minutes for the process of gluing and adjusting and your epoxy glue, having a long ‘open’ time, gave me more than was needed. Other products recommended to me by others were not epoxy and had doubtful adhesion to the oily teak, plus having a quite short open time which, in the event, would not have been sufficient to properly carry out the assembly.I have been most impressed with your glue which was easy to mix and use.Thank you very much for your helpful advice regarding this project. epoxy oak and teak woodglue. great product , exelent properties alround . Great for Teak. I used this glue to repair a part of teak on a sailing ship – worked perfect! Good glue. Just started using it but so far seems ideal for Accoya – which is a hard timber to glue. Great glue for guitar fretboard gluing.. Works perfect with any fretboard wood . It does not induce any unwanted moisture in the neck . Easy mixing . Oak & Teak Epoxy Adhesive. Nice and easy to dispense equal amounts ready for mixing from the 380mL bottles. Mixed lifetime long enough to allow plenty of assembly and clamping time. Finished joint being incredibly strong after a couple of days curing. Wish I had found this glue many years ago for all my boat repair work. Oak & Teak. I am new to this adhesive and purchased primarily for bonding cocobolo,but after speaking to Steve at makewoodgood he assured me it was good for filling voids, shakes and other natural defects in wood which it does, but I found it a bit too viscous for some of the smaller cracks, however I had about 1/2 an ounce left over so I thought I would experiment with some cellulose thinner and it does work obviously the curing time is extended but after 3 days it was solid so I can’t praise this enough. epoxy glue. About a year ago I purchased some epoxy glue for a job using oak. I wanted to be sure the joints held, especially the edge to edge ones. I was pleased with the results, and the fact that I was able to purchase a convenient volume of glue… not having to buy so much that it would be wasted or having to worry that I might be short. I still have a tiny bit left , but know when the need arises I’ll be back!